Official blog of Ideas Unlimited, Mysore. 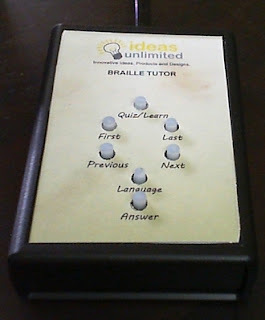 A couple of months ago we posted the prototype concept of a Brialle Tutor developed at Ideas Unlimited. The student team which developed it was short of time proved the concept, but it was still far off from being made into a product because of memory limitations and very limited sound storage. 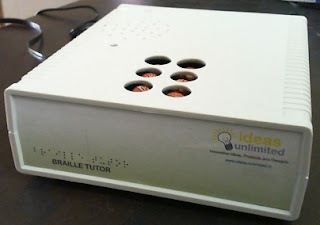 Video of the Prototype 2 of Braille Tutor at work. Video of the prototype field-tested at SVYM's (Swami Vivekananda Youth Movement) Community Rehabilitation Program output who work with blind people in Jayapura, HD Kote Road. Now an Investor from Geneva (Rajesh Nair, working in Geneva, Switzerland), is funding this product in personal capacity to turn this concept into a product. 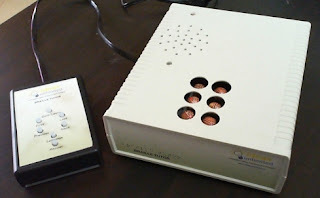 As a first step to making this into a formal product, in this Prototype-2, we have provided the Braille tutor with lots of memory to store audio files of multiple languages. Also the software has been streamline for good performance of both audio and the system as a whole. Remote control with navigation and mode (Quiz/learn) selection buttons. The product is useful for teaching of 'Pre-braille' - teaching braille letters to young children, before their hands and fingers get trained to braille letters. The process of learning such pre-braille and getting used to the braille dots lasts about 2-3 months in the initial stages.With this product we also hope to reduce the learning time, along with reducing the operational difficulties in such teaching. Tutor with its remote control. Add new and more language support in terms of medium of instruction. Current prototype teaches in Kannada medium. Design and build custom made solenoid to suit the application. None of the solenoids available seem to help much. Build a headphone interface for private operation without disturbing others. More features that can make this product useful in a typical blind school classroom. We are actively looking for formal funding for this endeavor. We have already shown this product to some blind people who are in the domain of teaching braille to collect feedback. The feedback was encouraging for us to take this step to make it into a formal product. ಪ್ರಯತ್ನಗಳು ನಿಜಕ್ಕೂ ಸ್ತುತ್ಯಾರ್ಹ. 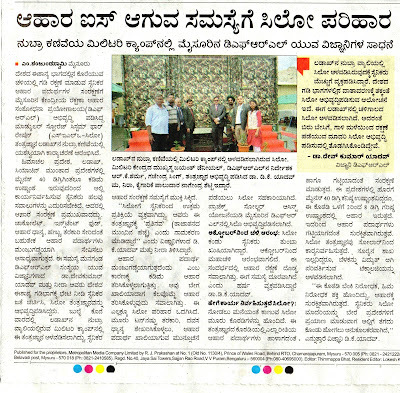 ನಿನ್ನ ಪ್ರಯತ್ನಗಳಿಗೆಲ್ಲಾ ಯಶಸ್ಸು ದೊರೆಯಲಿ. This is an amazing idea. I have a 7 year old child in my class who is blind and multiply disabled. He has recently become very interested in braille but because of his physical disabilities needs instruction using large dots. Regular braille dots are much too small at this point. He also really benefits from speech output. I would love to have a product like this for him to use! DIY: How to build a 'Poor man's milling machine' using a drilling machine!